[0:00:06.7] CM: Hello and welcome to Dive Happy, the podcast about the best scuba diving in Asia. This is another special edition of the dive happy podcast because we’re coming to you live from Triton Bay and I am joined this time by Simon Marsh, the cruise director for Dive Damai. Simon, welcome to the podcast. [0:00:25.0] SM: Thank you Chris, nice to be here. Thanks for inviting me. [0:00:28.4] CM: You’re very welcome, I didn’t really have a choice because I’m stuck on your boat. [0:00:33.4] SM: Yeah, it’s a good point. [0:00:34.4] CM: We have known each other now for five very long years and I’ve been privileged to be on several boats that you’ve been running or rather I’ve been privileged to several trips you’ve been running all on the Dive Damai and I realize that you’ve actually been cruise director in one form or another for a very long time. What I wanted to chat to you about is the nature of the job because I think for a lot of people, it would be considered a dream job. But I’m not really sure many people understand what’s involved. So can you tell me how long you’ve been looking after boats, in charge basically and how you got into it? [0:01:08.2] SM: Sure, it must be about coming about 10 years now, working and living on dive boats throughout the Caribbean and Asia now, about 10 years. [0:01:18.3] CM: Did you begin in the Caribbean? [0:01:19.9] SM: Yes, my girlfriend and I, we’ve been working as a pair together for 10 years now in liveaboard. Started with the Dancer Fleet, as it was then, now parts of the Aggressor Group. We had a break, we got lucky, we were in the right place at the right time and I’m from there worked our way through most of their Caribbean boats. [0:01:39.8] CM: Right, so you’ve moved around between quite a few different vessels. [0:01:42.5] SM: Yes, we worked on, actually we worked on three boats. There was potentially another two at the time that we could have worked on but yeah, we worked on three and then made the move to Asia. [0:01:51.6] CM: Right, just taking a step back for a minute, what is it about liveaboards in general that makes it — well, I’m assuming you think it’s a superior experience to resort diving. [0:02:01.0] SM: God yes, absolutely. It’s the whole convenience, I mean, everything is right here. You take 20 steps to the front of the boat, you’re at the dive deck, 20 steps to the back boat, you’re in your cabin, 20 steps upstairs, you’re on the sun deck and the restaurants right in the middle of it all. It really couldn’t get much more convenient if you tried. [0:02:19.5] CM: You’ve been in Indonesia for five years now? Or has it been actually been longer? [0:02:24.0] SM: It’s about five and a half now, coming six. [0:02:25.9] CM: Okay. Is Indonesia your favorite place that you’ve been working or do you have several favorites? [0:02:32.9] SM: I think as an all-round experience, yeah, it knocks the socks off almost anywhere. From a working point of view in my job, I really enjoy the interaction with the local crew, which is a very positive experience for me. I really enjoy being part of their team. I enjoy the diving, the diving is hands down the best for me. [0:02:51.4] CM: The best in the world? [0:02:52.7] SM: Oh god yes. The sheer variety. [0:02:55.0] SM: You’ve got everything. We’ve got hammerhead sharks, we’ve got manta rays, we’ve got pigmy sea horses, you know, from one end of the spectrum to the other. [0:03:02.3] SM: Whale sharks, absolutely, as we saw this morning. [0:03:05.8] SM: One end of the spectrum to the other; it’s got everything, it’s beautiful, it’s warm generally. Yeah, you really can’t go wrong. [0:03:13.4] CM: Given that you have been on boats so much. Most people would perhaps assume that the only thing you need to do to work on a liveaboard is to be a qualified diving instructor but what skills do you actually need to get to the position of being a cruise director and is there a kind of hierarchical path that’s recognized of how you would progress up the chain of command? [0:03:35.3] SM: Well, for us, the path was, we made it for us — I talk about us because that’s I guess history for me and one I know every well. We worked in resorts, we’ve worked in dive centers through the Caribbean, we worked in five star centres, we worked in shacks on the beach. We felt that we’ve done the dive centre I think. [0:03:52.3] CM: You paid your dues. [0:03:53.3] SM: Yeah, we paid our dues, we’ve worked in resorts, we’ve done all that and really we felt that we wanted to get on to liveaboards and that was the way forward. We just happened to have the right skills on being the right place at the right time and it really was as lucky as that. We happened to go to DEMA, we happened to bump into the sales manager of the Dancer Fleet, as it was then. They happened to need people with exactly our skills and we just meshed and it was sheer luck. [0:04:22.1] CM: Is it, did you have to go through a formal interview process? [0:04:27.4] SM: Yeah, we went through an interview process with them. Obviously, every company does it differently. I’m now responsible for hiring the cruise directors for our boats. Two boats and we’ve recently changed two sets of cruise directors. So I put an advert in something like the [inaudible] and that generally gets picked up by other diver jobs websites around the world and so you start receiving the CV’s and going through those. I guess actually we self-selected in the first instance by being very clear about what we’re saying and what we want. We’re very much, we believe in couples, we believe in people with multi-skills. I don’t need CV’s and the CV’s that went straight up window were the ones that started, “I am an OWS dive instructor, I’ve got 450, blah-blah-blah.” I’ve fallen asleep by the third line. Yes of course you’re an OWS cert, that’s all I really need to know. I know you can dive, I know you can teach but what else can you do? That’s really what it’s about. [0:05:21.6] CM: Can you name some off those other sort of essential skills you’re looking for besides obviously knowing how to dive. Go ahead. Let me just talk over you! [0:05:32.9] SM: Stop interrupting, Christopher! Yes, obviously we’re here on our liveaboard, we’ve got a hotel, we’ve got a ship, and we’ve got a dive centre all rolled into one. I’m interested in people who obviously if they’ve got hotel management, that would always be interesting to us, any kind of hotel management and for a boat of this level, high end hotel management would be nice or hotel management experience would be nice. As the operations manager, it’s important to me to have people that I can communicate with on the boat if there’s a problem that something needs repairing or replacing. I don’t always get the clear information that you might hope for from a local crew member. So I need somebody that can go down stairs and speak to them and come back to me with a clear answer, “We need that part for this item and we need it next week.” So we’re looking for people that have got some kind of technical background, maybe. [0:06:20.5] CM: Also some kind of empathy in terms of explaining it to other people. [0:06:24.2] SM: Communication skills, yeah, absolutely. I mean, one would hope that an instructor would have some kind of communication skills but that’s clearly not the case. [0:06:33.3] CM: That’s interesting you say “looking for people with hotel or resort experience” because yeah, I hadn’t really thought of it in that sense and I guess that is what it is first, isn’t it? [0:06:40.2] SM: Yeah, number one. That’s what it’s all about and that’s what sets out apart from the other boats. Any one of a 50 or 60 liveaboard currently in Indonesia could take you to the places that we go. But there’s only probably half a dozen of those and probably less that could do it with the style that we do it and that’s what it’s all about. So we need people that have proven experience, managing a local crew and providing a good service to their guest and ideally that’s going to come from a hotel or resort. [0:07:08.9] CM: Right, so you don’t actually get many people coming to you that have been on previous liveaboards? [0:07:14.5] SM: There’s a huge element of luck there as well. We do prefer to train our own generally, but of the two couples we’ve just hired, one couple have got extensive experience working with another major fleet and they’re great and we’ve known them for many years and that came to us as friends first and they happened to become available just as we were looking, which is great. [0:07:58.4] CM: You kind of want to mold them into your own grotesque caricature? [0:08:04.1] SM: Is that egotistical, or arrogant, or both? I’m not sure. [0:08:26.1] SM: Yeah, absolutely. 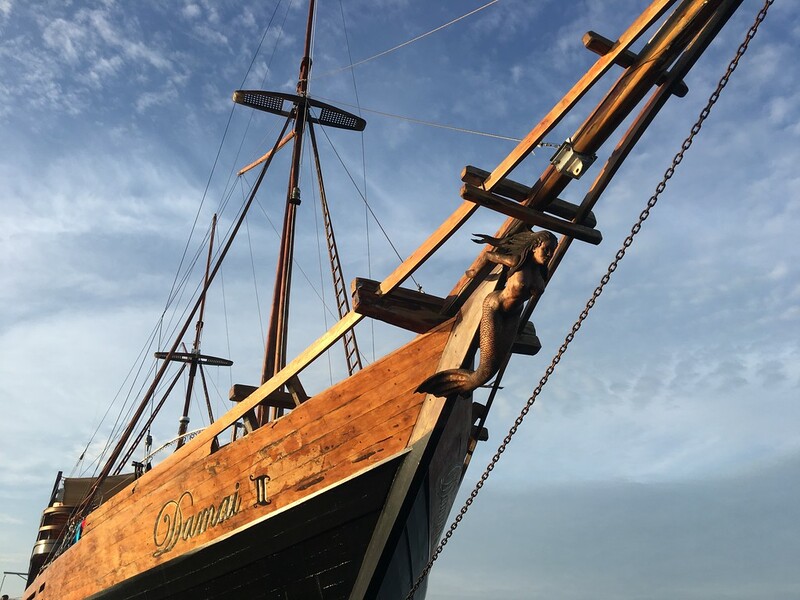 The other thing as well, if someone had come to me saying, “I’ve got liveaboard experience throughout Raja Ampat, The Banda Sea, and Komodo, they’d be in the top of the pile because that is something that is invaluable. The local knowledge is always going to be good. [0:08:43.4] CM: Speaking of the local knowledge, you mentioned already how much you enjoy working with Indonesian crew. So how long did it take you to learn Bahasa Indonesia when you moved here? What did you do? Did you do like intense lessons or just go with it on the job or? [0:08:56.2] SM: Yeah, we did a month — we basically, we found ourselves without a job in Indonesia because we came here for another job and in three months it didn’t work out. Then we found ourselves with some time, we decided we were staying. We’d seen a little bit of the diving and decided it knocked the socks of anything else we’ve been doing. We were staying, so we decided we were going to invest time and a little bit of money in learning the language because we had realized that that was going to be important. We did intensive one month four hours a day, five days a week. That worked out very well for us. My partner, she’s also a language teacher, which helped. She kind of guided and led our afternoon private study sessions and we got a lot out of that month. [0:09:41.7] CM: That’s awesome, I never knew Andrina did that. [0:09:44.9] SM: Yeah she does. She’s good at that. [0:09:46.9] CM: She’s the brains of the partnership, clearly. [0:09:50.1] SM: Then of course as there’s the immersion aspect as well, you know? We’re here, I cannot bare to not be able to communicate with people. You want to communicate with 80, 70% of our crew, you’ve got to speak Indonesian, and it’s as simple as that. [0:10:05.6] CM: How does it work in terms of you working with the captain because you have a captain’s license yourself, right? [0:10:12.1] CM: What was the process for you to gain that? [0:10:21.7] CM: Okay, carry on. It’s just the crew having a fit, it’s fine. [0:10:28.2] SM: That was a question of gaining sea time and experience on board a ship and then going to school once, can be back on, getting small sea time, going back to school again and the system that they Aggressor Fleet at the time was the potential to get promoted and advanced to officer and even captain level was quite quick. In my case, particularly quick. I was captain within 18 months of joining the boat. [0:10:54.3] CM: Did you find that actually quite a — were you sort of really excited about becoming a captain? Because obviously, that’s quite a huge amount of responsibility. [0:11:01.7] SM: I was scared. [0:11:03.4] CM: Okay, I’m glad you said that. [0:11:07.4] CM: Sorry, what size boat does the captain’s license qualify you to? [0:11:10.3] SM: That was a 200 ton boats. [0:11:13.1] SM: 200 ton off shore license. [0:11:19.0] SM: That’s a good size. [0:11:18.5] CM: That would be pretty much any liveaboard? [0:11:21.4] SM: Yeah, not the size of around here, not a 38 meter long wooden [inaudible], no. In terms of the fleets that that company had, yes, it fitted most of their boats. Much smaller vessels. [0:11:46.1] SM: He has the final say from the points of view of “it’s not safe for us to go there”. So if there is a good reason, we shouldn’t be going there then obviously we as cruise directors would work with him on that. But he will follow our requests because he wants the guests to be happy. He knows that we’re making the best decision based on the diving, captains never dived in his life, but he will follow our recommendation for diving and let us now a few things that’s good plan. [0:12:13.1] CM: Okay. Now, speaking of being safe, that’s one of the interesting things about, obviously diving itself is a little bit risky, but the logistics of day to day operations on the boat. I know in Indonesia there’s several different things that happen that are challenges to deal with local villages and so on. Can you explain a bit of that, how you handle it and what you have to do? [0:12:34.3] SM: Sure, I say challenges but it’s also for me part of the fun of the job. We’re right here in Triton Bay and, you know, it’s very relevant in this area and around Papua generally but particularly Triton Bay and over in Cenderwasih Bay. The local villages, the Papuans, they’ve got right of tenant-ship over their reefs and the area around their village. Very much, it would be like someone walking into you back garden and sitting down and having a picnic. It’s rude. It’s as simple as that, it’s just rude. So you show up, we got to a new area. Triton Bay is a good example, we have the three areas that we have to report to here; three villages, three families actually. You go in, you pass the time of the day with them, you ask after the weather, you ask after the fishing, you know, “How’s the family, how’s mama? Does she still like our bread? Here’s some bread for her, here’s some coffee, here’s some sugar. Is it okay if we do some diving?” “Yes, of course it is.” “Here’s some money.” Which is obviously the crux of the matter, is money, it’s always important. Then we will shake hands and share over by, take a few selfies and it’s done. [0:13:56.3] CM: Right, because isn’t a lot of the, Papuan resemblance maybe too strong, but the reason why they feel aggrieved towards liveaboard is because for all the money that gets paid towards national parks in Indonesia, it all goes to Jakarta and none of it really seems to come back to Papua itself. [0:14:10.1] SM: Absolutely, yeah. That’s very nicely led. Well done. I like that. [0:14:13.4] CM: You’re not meant to actually say it, you fool. [0:14:16.4] SM: Oh, okay, I was supposed to just fall into the hole, right? like Alice? [0:14:20.0] CM: You’re meant to segue nicely. [0:14:21.3] SM: I’m Alice, am I okay? Alice falling down the hole. Yes Chris. Yeah, it’s very much the case. In Papua, in this area of Triton Bay it’s very relevant because we’re here. The money’s operated by a local marine protected area and is operated out of Kaimana, which is only 20, 30 miles away but we found that the money we’re paying for the required pin, as they call it, which is your marine park tag was not finding its way to the villages. That kind has been blowing up over the last couple of years into some pretty strong resentment on the parts of the families because they know what’s going on, they know that money’s being taken because the liveaboard have told them because we’ve shown up here and said, well, I’ve done it myself. I’ve had angry people come and say, “What are you doing in our area?” “Hang on, I’ve paid, here is the receipt. I’ve got the receipt from Kaimana, I paid 500,000 rupiah, which is what? $40 per guest to be here and I was told that’s fine. I’m really sorry if it’s not,” and they said well no, it’s not actually. It’s not good enough, you have to pay again and this lead to, a couple of years ago, and actually it’s come and gone in waves over about the last six or seven years of some real resentment from the villages towards the liveaboard. In the end, it actually culminated in them stealing tender votes from the liveaboard because they felt rightfully aggrieved. The money was being paid but obviously not making its way here, whether it was going into personal pockets or disappearing into budgets for other things, I wouldn’t like to speculate. But yeah, that’s very much the case and same in Cenderwasih and the same has been said of Raja Ampat locations but that situation is better managed. [0:16:04.6] CM: I don’t want to sound facetious, but how do you look for a skill-set that someone has experience in dealing with angry people throwing spears at the boat, which let’s face it, that is not a pleasant situation. [0:16:15.8] SM: It’s not, no. Absolutely. It’s a calm under pressure thing. We’re looking for people that come under pressure, when the world’s going crazy around you, you’re little duck paddling away underneath and sliding swimmingly over the lake, that’s pretty much what it is and that applies to many aspects of the job. You know, when you’ve got a broken generator downstairs and you know you’re holding onto the trip by the end of your fingertips because you know you’ve got one more day and you’re just hoping that that doesn’t break as well otherwise things are going to go just badly wrong. Paddling away underneath and the ideal is the guess will never know that’s happened or it’s happened. [0:16:56.9] CM: That actually seems to be the overarching thing. You talked about language skills, dive skills, management skills being perhaps the most important but also that general attitude or just sense about life of just sort of rolling with it and not being overwhelmed or freaked out by — when the situation gets a bit out of hand that you just find a way to get back on top of it. [0:17:18.5] CM: Rather than just sort of giving up. [0:17:20.4] SM: That’s what it’s all about. I’ve always been that kind of person and Andrina is as well. We’re good at rolling to the punches. [0:17:27.8] CM: Actually, as far as I can work out, you actually kind of enjoy that? [0:17:30.9] CM: Perhaps not in the moment. [0:17:32.6] SM: I’ve inherited that from my mother. There’s nothing like a little bit of background stress. [0:17:37.5] CM: She is indeed a formidable woman. I have done a liveaboard with her and I know that very much. We talked about the challenges a little bit, but why don’t we talk about the happy stuff? You’ve done this for a long time, so what keeps you going? [0:17:53.5] SM: I love it. Look out of that window, the sun is just going down right now. You know it’s perfectly calm sea, we’ve got the Papuan country side, we’ve got green hills. There is probably a hornbill or two flying past just over there. You know, it’s idyllic. [0:18:10.1] CM: That was wonderfully [inaudible]. Well done for giving me that picture. [0:18:17.0] CM: Yes, no you did that very well. Yes. [0:18:19.9] SM: But it is, I love being out here. I love being in the frontier areas. I hate being in places like, I don’t hate it but it’s difficult for me to be in places like Komodo where there are just people everywhere but I love being in areas like Triton Bay and Cenderawasih Bay and out in the middle of the Banda Sea where it’s peaceful. It’s quiet, you don’t see another boat. The people that come and see you are generally locals looking to sell some coconuts or get some petrol off you. It’s a nice life. It’s a very nice life and let’s not forget the diving. [0:18:54.8] CM: Well yes let’s not, that’s why we’re here. [0:18:56.9] SM: Exactly. I do two dives a day when I’m working and I love every minute of it. [0:19:02.4] CM: That’s interesting because a lot of people do seem to get somewhat jaded with diving. Obviously pressures of the industry itself I can see how people burn out being an instructor dive guide whatever, but it seems to me that a lot of people go through cycles of diving itself. Like even if they had, they just get fed up with getting in the water. They get fed out with looking for whatever they’re looking for. Would you agree, or? [0:19:23.5] SM: Yeah, of course. Yeah I think so and I have been there. I mean now as you know we’re more based in Bali in the office, running the office side and the operation side for me and we’ve been, when we got off this boat two and a half years ago, we’ve been doing the job for over seven years and we’ve never had a home. We haven’t had a home in seven years. We’ve had a standard one suitcase somewhere on land and two dive bags with one suitcase on whatever boat we happened to be on. So when we got to go to Bali and actually live on a house, it was nice and a year ago we rented our own place and I think I just rented a room from somewhere else before and it’s bliss. It is absolute bliss. But I do get to the point where I’m thinking, “When are we going diving again?” But after six weeks on the boat, as I’m coming up to, I am beginning to say, “Well it’ll be quite nice to go home again, be on Bali and do my thing there.” So it’s nice. I’m really enjoying having the two centres of my life now, in Bali and on the boat. [0:20:29.4] CM: Sure, I mean you are now a gentleman of a certain age aren’t you, like myself. Middle age I think is what they call it. [0:20:35.9] SM: Middle aged, yes. [0:20:37.1] CM: Middle aged. But it’s interesting, isn’t it? Because obviously that is always the stereotype about dive instructural crew. I’m not sure if it’s stereotype about cruise director but let’s go with it. I feel like a dive bum yada, yada, yada and always struck me that obviously that lifestyle is great but it’s lack of permanence is precisely what causes a lot of people to have a meltdown or burnout in the end because you need to step away and have a different life a bit of step back into it. Are you a need instructor for while and then go back into the crazy? [0:21:21.4] SM: I haven’t told them yet. [0:21:23.7] CM: You’re just going to make it up as you go along? Oh dear, I hope they’re not listening. [0:21:28.6] SM: I hope they’re not listening. I mean, at the end of the day something is going to happen at some point and something is going to go wrong that’s going to put a lot of stress on them and they’ll sink or swim and that we can do all the interviewing you’d like with people. We could send them off with a personality study, that or an analysis but at the end of the day, but until it happens we’re not going to know how they can handle it and different people handle it different ways. I just hope that they’re going to handle it well. I know the other two had already had a minor crisis that they handled perfectly well and so that’s good. It’s always nice. [0:22:03.3] CM: So they are living up to what you’re hoping they would be. [0:22:06.4] SM: Yeah absolutely, they had an excellent track record anyways. Yeah, you don’t know until you get there. That is really what it comes down to. [0:22:14.1] CM: Yes and speaking of handling people, let’s talk about the other major component of any liveaboard, and that’s the guest. [0:22:23.3] SM: The boat would run wonderfully without guests. [0:22:26.8] CM: Yes, it would be far easier. [0:22:27.3] SM: Yeah much easier. [0:22:29.2] CM: Every time I’ve been on Damai which has been quite a few times, it’s always seems to attract a really interesting group of people and it’s very rarely been people being difficult for the sake of it. I’ll see certain people have certain requirements and if they do get annoyed if they’re not met because they have specified what they are and I think that’s fair enough. If they’ve been told it’s going to be met and it’s not then they have the right to get aggrieved. But how would you find being with obviously a different group every 10 days, so it’s always a different dynamic going on or do you see patterns in those groups? They’re it’s four types of dynamic and this is one of these trips or what are those kinds of trips or is it just completely random? [0:23:08.7] SM: Well we do have two kinds of trips. The charter that’s been sold by a third party so we’ve wholesaled it out to somebody else and that depends. If it’s a trip that comes with a group leader that’s their problem. We can’t let them get on with it but some are better at it than others and then there’s the independent traveler groups which is boats that we’ve sold and we’ve bought people in from different areas such as on this trip. Sometimes we have to scrap around who the boss, who our customer base and come up with new just fix all the bed. So yeah, there’s two different types of trips. There’s the Charles Trip and then there’s the FIT Independent Traveler trip. So if it’s a charter trip, particularly if it’s a specialty trip like a photography trip or a Chinese trip, you know they tend to be much, in some ways easier, for us to deal with because we can sit back a little bit because often the people know each other already. They’ve come as a group, they come as friends or at least they know each other and they have a common interest and they’ve got something to talk about over the dinner table. Now an independent traveler group is a different kettle of fish altogether because you’ve got people of different nationality. This trip we’ve got two German, two Australian, three Chinese, one English. [0:24:25.6] SM: So yeah, plenty and lots of couples with completely different ethnic backgrounds and so that makes the job a little more challenging and you’re going to have to make sure that you are moving yourself around the dinner table every meal so that you are interacting with people trying to spot the people that are not interacting with others and not to try and make them interactive if they don’t want to but to make sure that they’re retreating back into a hole. [0:24:47.4] CM: Absolutely, yes because it can be quite intimidating for some people, can’t it? [0:24:51.2] SM: Yeah, if English isn’t your first language and you are sitting at a busy dinner table with lots of English guy all around, it’s good if somebody there will come and sit with you and quietly talk to you with your own speed and your own volume. [0:25:02.0] CM: Yeah for sure. [0:25:02.8] SM: So yeah, that’s definitely a skill as well. [0:25:04.6] CM: Is that again something that you just think, “Well people have either gone out or not? [0:25:09.5] SM: Yes, absolutely. You can’t teach it. [0:25:10.1] CM: When you’re looking at CV, okay. [0:25:12.2] SM: You can’t teach it. People can either pick up on that and quietly hone in on that or they could be the sort of person that wants to dominate the dinner table and that’s not the people we need. We need the quiet people that can sit back, observe, join in the conversation and identify who needs to be helped not slipping down the hole. [0:25:31.4] CM: So that takes us back to the empathy thing as well which is quiet, yeah. [0:25:34.1] SM: Empathy is big, yeah. Even if somebody’s air conditioning is broken and you know there’s nothing you can do to fix it on this side of tomorrow night and they’re going to spend another hot night, you’ve got to be empathetic. “I’m really sorry. It must be terrible for you,” but yeah, it doesn’t always happen but empathy is a big one. [0:25:53.6] CM: Yeah, now you don’t have a brig on this boat do you? [0:25:57.8] CM: What happens then when and I am pretty sure I’m not alone in saying this to all of our listeners, hello mum, if you’ve been on several liveaboards on some point you will encounter a troublesome guest or guests and so I’m always interested in how liveaboard staff are trained to deal with that because there must be a procedure to follow. [0:26:16.7] SM: I’ve been lucky. We haven’t had any significantly difficult, I personally have not any significantly difficult guest. There are. [0:26:23.9] CM: In your 10 years of? Wow. [0:26:25.1] SM: In my 10 years, there had been people maybe it’s because I am who I am. I’m upfront and I’m quite a big carrots myself and I recognize that myself so when I have to push that down. I’m very clear on my instructions and I lead I suppose. I think people are difficult generally or more difficult if they sense weak leadership in the boat. [0:26:50.5] SM: I honestly believed that because I’ve had guest that I have thought, “Yeah, okay” I can see it in them but I haven’t had any big problems and other people have said, “Well talk with so and so” because obviously we all talk to each other. It hardly is a melting pot of cruise directors as even now that I think about it actually I’m opening a retirement home for ex-cruisers in Bali because I’m sure we’re all heading that way. But yeah, strong leadership I think helps overcome that but yes, there are odd balls, there are people that aren’t fitting in or I see some people that don’t want to fit in. I’ve certainly heard about a few carrots are behind this but yeah. [0:27:27.4] SM: Yeah, it happens. [0:27:29.0] CM: On the flip-side, I mean obviously for a lot of people, I actually don’t know what percentage of people come on down that might not have been on a liveaboard before but that side but a lot of the time, a lot of the liveaboards there are always people coming to liveaboards that have never been on one before. [0:27:45.4] SM: I hope so otherwise the industry then might fade. [0:27:48.2] CM: Yeah but I think what struck me for a lot of people is actually quite a big commitment or a big step to make to do that first liveaboard because I think it’s that sense of like, “Well if I don’t like you I am stuffed because I am stuck on the boat for 10 days,” or whatever. So is there any given that you have looked over hundreds of guests over the years is there any particular advice about things that they should think about or they should bring or what they can do to prepare before they go so they can have the best time? [0:28:13.7] SM: Bring a good attitude. You want to interact and be part of the boat and join in the conversations at the dinner table, and enjoy yourself. Other than that, if you are not the sort of person that enjoys being in a social situation because this is a social situation, of that no doubt and everybody is interacting with each other on a daily basis and hourly basis, be it on the dive deck talking about diving underwater around the dinner table. If you’re not the sort of person that enjoys that, you’re going to be sitting down in your cabin, which fortunately on this boat are larger than most but it could be a box then you’re really not going to have a good time. You’ve got to be prepared to put yourself out there a bit and enjoy yourself. Bring someone with you as well that enjoys your company and you enjoy their company. At least if everyone else is an idiot, at least you got one person you can talk to. [0:29:04.0] CM: We’ll start bringing this to a close. You mentioned earlier that you… Yeah, exactly. You mentioned that you really enjoyed the frontier diving in depth so do you have one specific area that you get really excited about going back to? I don’t mean a region, I mean a particular area or some secret island or whatever, one particular group of dive sites? [0:29:26.2] SM: Yes, Banger Islands. [0:29:29.1] SM: I love Banda Islands. [0:29:29.7] CM: Really? Interesting, Nusa Laut and Lava Rock and all of that stuff? [0:29:32.1] SM: Yeah, Nusa Laut and Ambon really but yeah, the next stop down you come into Suwangi, which is a rock just north of the Banda Group and then you come down to Banda Neira then you’ve got Hatta Island and you’ve got Run. The diving is good, it’s certainly excellent diving. What I love about it is the history and the feel of the place. It’s got such a wonderful history of the whole spice wars that happened between the English and the Dutch down there and the poor Indonesians who got stuck in the middle of it. Well obviously, they weren’t Indonesians then. They were Malukans, or whatever they were but the area itself for me is some way that I always get excited about going back to. Probably also added to the fact that you don’t get to go there very often. You can only get there for two months out of the year. [0:30:20.7] CM: Because the Banda Sea is so rough otherwise. [0:30:23.0] SM: That’s right, you’ve got the transition months between the two seasons, between the two monsoons when you can go, it’s roughly April or October. So that also adds a little bit of unavailability to it I suppose, but yeah, anytime if anyone would ask me that I would say Banda and it’s a beautiful place. It’s really lovely. [0:30:42.1] CM: Okay, I think you have already answered this question earlier but I will finish with it anyway, do you plan to stay in Indonesia indefinitely? [0:30:49.1] SM: I think you could probably hear I love it here. We’ve got no plans to go anywhere. We enjoy the country, we enjoy the people, we’ve gone through the trouble of learning the language. To me, mean that’s a big, big step. I managed five years in Spanish speaking countries and with barely a “Hola” to utter my lips. [0:31:07.5] CM: Ola you mean. [0:31:09.1] SM: Yeah, well that one see? See? Whereas now I’m reasonably fluent in Indonesian and so we’ve made a big investment in terms of energy into and in the area and we really love it. It’s so rich and varied and there’s so much that we still have to explore beyond the diving. I’m very, very lucky. We’ve done the best diving in the world in my opinion and there’s so many different headings and it’s really nice to know that there’s still so much to do here that we haven’t. [0:31:37.8] CM: Do you think as well that you’ll continue being a cruise director indefinitely or do you think as you get older even older, you’ll want to transfer into something a little less day to day stressful? [0:31:48.9] SM: Well not really. I mean I already have, I’m already doing the operations between by no stretch the imagination less stressful and instead of managing one boat, I now obviously am managing two and I don’t get to go diving. [0:32:06.9] CM: Well done Simon, good work. [0:32:07.7] SM: Well done me. But you know, I think you’re right. I think what you’re implying is not going to be a 70 year old cruise director? No, that’s obviously not something attainable and the energy and I suppose the image as well as an image aspect to it for the company. Even at the age I’m at, I’m still a youngster by the standards of many of our guest probably 60, 70% of our guest are older than me so I’m still a spritely young thing. [0:32:35.1] CM: Which is a genuinely terrifying for that. [0:32:37.3] SM: As I’ve proportion start going against me, you have to think about it. [0:32:41.5] CM: Would you clearly, you’re not going to give up diving but what would interest you to continue doing this as a job or a career or we just going to wait and see what happens? [0:32:52.2] SM: I’ve never been a great planner, I actually have no idea where we would go from here. This to me is the best job. I love this job, I get to live in Bali, I get to have friends in Bali and a life in Bali and then I get to spend four or five months a year on the beautiful liveaboard, for free by the way, and they pay me. What’s to change? I mean, we were gypsies for a while, we traveled around Caribbean, we lived there many central American countries and Caribbean countries and came to south east Asia and fortunately for us, we’ve only really had to do Thailand and Indonesia before we finally found somewhere we wanted to stop. Actually talking to my friends in Bali, many of them are exactly the same opinion. Many of them you know. A lot of them have done this job as cruise directors, they’ve worked in Indonesia and we’ve all had said more or less the same thing. We were passing through, we were doing a job and you know what? We don’t know where we could possibly go from here that would compare in terms of the lifestyle and the diving and just the weather. Sorry, I hate to finish this on a week by that. [0:34:03.3] CM: Nope, it’s important, you do come from Croydon after all. [0:34:06.7] CM: All right Simon, thank you very much, that was fun. [0:34:13.0] CM: Thanks for listening to the Dive Happy Podcast. For show notes about this episode, including maps of where we’re talking about, travel tips, links to the liveaboards, resorts, books, et cetera, that will we mentioned and other good stuff, please visit divehappy.com/podcast. If you want to get in touch, send me an email, chris@divehappy.com. If you want to know when the next podcast comes out, you can sign up to the Dive Happy mailing list on the website or follow on Twitter @divehappy. Until next time, drive safe, and dive happy. Cheers. Simon Marsh is the Cruise Director on the Dive Damai liveaboard. For a lot of people, it would be considered a dream job, but not many people understand what is actually involved. Simon has been working and living on dive boats throughout the Caribbean and Asia now for almost 10 years. He started out with the Dancer Fleet, now known as the Aggressor Group, and was at the right place at the right time to catch a lucky break. From there, Simon and his girlfriend, Andrina Bindon, worked as a pair on most of their Caribbean boats and then eventually made the move to Asia. For Simon, a liveaboard experience is much more than you could ever get form a dive resort, with everything right at your fingertips. For Simon, Indonesia is hands down the best place to dive in the world. As an all-round experience, it knocks the socks off almost anywhere. From a working point of view, Simon loves interacting with the locals, which is a very positive experience and he loves being part of the team. Simon and Andrina even spent a whole month learning the local language in order to better communicate with the crew and the local villagers. From a diving perspective, the sheer variety is what really makes it over the top amazing. You’ll see everything from hammerhead sharks, to manta rays, to pigmy sea horses, and even whale sharks. One end of the spectrum to the other; it’s got everything. It is beautiful, warm, and you generally just cannot go wrong. Simon and Andrina worked in dive centres all over. From pristine five star locations, to shacks on the beach, they did it all. Soon enough they knew they wanted to move on to working on a liveaboard, to really get out into the world. When he bumped into the manager of the then Dancer Fleet, they happened to need people with the exact skill sets at that time. So it was sheer luck! From there Simon has worked his way up to being a cruise director and now he is the one in charge of hiring new cruise directors. They believe in couples, people with multiple skills, and are very clear from the start about who they want and what they expect. He places a high value on past experience in the diving industry, as well as knowledge of the local people. In Triton Bay there can be some challenges with diving in the waters that belong to the local people. However, this all comes down to understanding their culture, and what the surrounding reefs mean to the people. The Papuans have the right of tenancy over their reefs and the area around their village. They have the rights for foraging and hunter gathering in there and around their reefs and for people that do not have many resources, the reef is extremely important as a resource to them. For the locals in the Triton Bay areas specifically, to them the reefs are like their very own backyards, and if you just dove in it would be considered rude. Instead, Simon and his team visit with the villages, give them gifts, and ask their permission to dive in the area. For Simon, the Banda Islands is a place that truly stands out to him and is one of his most loved diving areas in the world. It carries such a wonderful history of the spice wars that happened between the English and the Dutch, and the Indonesians who got caught in the middle of it all. The area itself is somewhere that Simon always gets excited about going back to. Another factor that plays a role is that you do not get to go to the Banda Islands very often. You can only get there for two months out of the year. That also adds a little bit of unavailability to the region, making it more precious to avid divers. It is a beautiful place that leaves you excited to come back for more.